Good morning to all of you sparkly people of the nail world! I have some great products to show you today! A couple days ago I had the chance to receive a sample of Sparkle & Co. Gold Chrome Powder and now is the moment to show you the result of it and I have to say it is gorgeously shiny. 1. Apply Sparkle & Co. base gel and cure. 2. Apply Sparkle & Co. Black gel color and cure. 3. Apply Sparkle & Co. Top gel and cure. 4. Clean the surface of your nails with rubbing alcohol. 5. 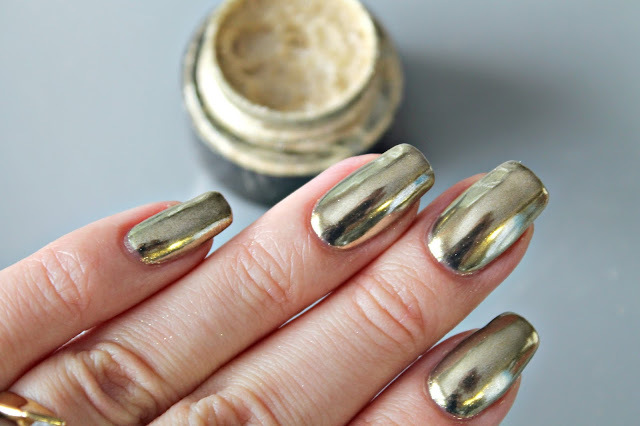 Rub the gold chrome powder on the nails with the gel applicator. 7. Apply Sparkle & Co. Top gel and cure. Now I want to make things clear as it is possible the you will not get that perfect shiny result at first and it is normal. The last 4 steps of the process might have to be done twice for a better and full coverage. My final word about their gold chrome powder is that the result is amazing and it really is easy to apply. I really enjoyed using it!